Ori Menashe may be flat out the most zealous chef in Los Angeles. At his new Middle Eastern restaurant in the Arts District, Bavel (the name’s based on a biblical tower) the Bestia chef oversees an operation that’s as tight as a trip wire and powered by an industrial-size reserve of fire and salt. Mediterranean sea bream and prawns marinated in spicy harissa paste are cooked whole over a wood-fired grill, its leaping flames befitting a beach bonfire; a few feet away, pillowy rounds of pita, made of dough flavored with fresh olive oil and fermented for three days, emerge steaming from a domed oven. They’re quickly ferried to tables piping hot, alongside swirls of tahini-rich hummus crowned with spicy duck sausage. If snagging a table at Cal-Ital Bestia has been an exercise in persistence since 2012, it’s almost as tough at the Angelini Osteria veteran’s new spot, which sits less than a mile away. Set in a converted warehouse beside the 4th Street Bridge, it’s packed to the rafters until the wee hours, a lush tangle of vines overhead offering oasis-like tranquility. Bavel’s menu, too, is something of an oasis. 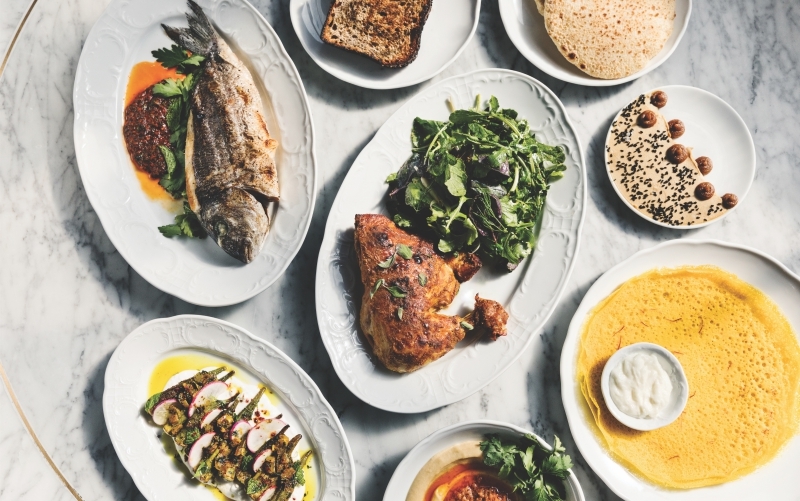 Menashe, who spent much of his childhood hanging around his father’s bakery outside Tel Aviv, teases out threads of Israeli cooking that stretch to Lebanon, Turkey, Morocco, Georgia, and beyond. Fat summer okra, poached in oil until they begin to melt, come layered over whipped feta amplified with black lime, cumin, and slow-burning marash pepper. For a showstopping spin on shawarma, Menashe rubs a hulking section of lamb neck with earthy spices, roasting it so that the juices seep onto house-baked laffa bread below. A heap of saltbrined cabbage and an explosive habanero-spiked version of the pickled-mango condiment amba come on the side, providing a contrasting punch of acid and heat. Though the cocktails are fine, a wine list that digs deep into regions of France and Italy is better. But the final spark of the evening comes from Genevieve Gergis’s exemplary desserts. A picturesque bonbon has black licorice ice cream and sour licorice caramel sealed in a shell of caramelized white chocolate sprinkled with sea salt. Sticky, sweet baklava, the treat of countless kebab shops, is elegantly reconfigured with walnut and warm apricot and a swipe of fresh farmer’s cheese.